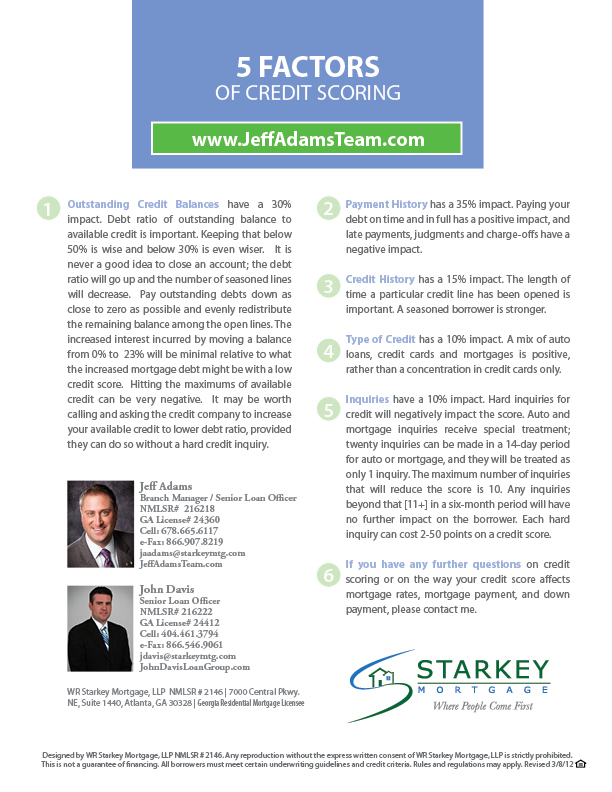 So how are credit scores determined? Sales prices are on the rise…. The Atlanta real estate market is bouncing back. Sales prices and inventory are on the rise; yet there is a decrease in the number of homes sold. Although we have more homes for sale, we have fewer closings. So what’s up with that? The answer is we are approaching a balanced market that is neither a seller’s nor a buyer’s market. 6 month’s inventory is the line of demarcation between buyer’s & seller’s markets. We are currently at the 6 month point for homes priced between $250,000 and $450,000. Price ranges <$250,000 are still in a seller’s market although they are approaching balance as well. Price ranges >$450,000 are in buyer’s market range. Other contributing factors to fewer sales include over confident sellers pricing too high. These sellers may not have listened to their Realtor® or their Realtor® told them what they wanted to hear instead of what they needed to hear. Even worse, they set the price themselves based on what they found on some of those websites out there. Additionally, showing condition is more important now than ever. Today’s buyers are very value conscious and are really reluctant to pour a lot of their hard earned money into repairing or updating their new home. Buyers want a home that is move in ready. They might be willing to repaint the purple room or do other light cosmetics to personalize the home. However, they refuse to accept deferred maintenance items that many sellers have ignored over the years. As someone whose identity has been compromised, I encourage you to take advantage of this free seminar presented by my long time, trusted advisers at Olson Associates. Even better, a Secret Service Agent will be presenting on this very important topic. BTW, if you think you are safe, be VERY CAREFUL! My identity was invaded in the work place; just another reason I’m self-employed. 😉 If you would like to attend the seminar feel free to click on the registration link below, contact the Olsons directly (be sure to mention I sent you) or let me know and I’ll reserve a space for you.